The earliest known ancestor of my Beirne family is Thomas Beirne, <1817-->1869. Thomas Byrne, <1817-->1869, most likely was born in the townland of Drumrew[e]y, Catholic and civil parish of Inishmagrath, Diocese of Kilmore, Barony of Drumahaire, PLU and Superintendent Registar's District of Manorhamilton, Dispensary and Registar's District of Drumkeeran, Co. Leitrim, West Breifne, Connacht, Ireland. The townland of Drumrewy borders the town of Drumkeeran and is located at Longitude W 8.07.30 and Latitude N 54.10.30, NE of Lough Allen. My direct Byrne ancestors did not immigrate so I am not sure of the spelling of the last name. The family name of Bryne can be spelled several ways, Byrne, Bryne and Beirne. Beirne is the spelling from Co. Roscommon and Co. Leitrim that is the most common. As Sean O'Beirne states, "The Byrne's and O'Byrne's of Co Wicklow and thereabouts are a totally different clan than the O'Beirne's of Cos. Roscommon and Leitrim or the old territory of Tir Briuin; sometimes more easily located when written as Tir Briuin na Sionna which translates as the country of the O'Beirne's (Ui Briuin) of the Shannon. This is dealt with at length in "The Family O'Beirne" by the late Prof. Bryan Beirne, and to some extent in Issues 1 and 2 of "The O'Beirne Family Journal" which can be found at http://www.obeirnefamily.mcmail.com . Most so-called Byrne's in Co's Roscommon, Leitrim, Longford, Sligo , etc., were misnamed by British civil servants or West Brits from Dublin. A handful adopted that spelling. But historically they were all members of the O'Beirne Sept. Also, note that the O'Beirne shield is, design wise, closer to that of the O'Conor's of Connacht whereas the O'Byrne crest has, what some might call, a decided Norman tilt in design reflecting the influence of the Pale, etc". A different family Arms and a bit on the history of the name Byrne from Dominick Byrne, "The Byrne name is in fact derived from Bran, King of Leinster whose death in Cologne is recorded by the four masters in the year 1052. Uí Faoláin, the name of their original home, covered much of what is now north Kildare. They were forced from there by the Norman marauding armies in the 12th century into the mountains of Wicklow and South Dublin. There they became a strong family. Their main seat was in Ballinacor, Co. Wicklow where they continued to inaugurate chieftains up until the close of the 16th century. The book of the Byrnes is in the National Library of Ireland called "Leabhar Branach", it recounts the deeds of the family in verse, mainly covering personalities from the 16th century." Of all the eight histories, the Byrne one has the least amount of hard data and some that I have is in conflict, yet to be resolved. Hence, I need to ask your understanding when reading this history not to judge the story or facts too harshly. I hope to improve both the style and content as soon as possible. The other more developed Irish histories, McTiernan, McGrail and Carney histories have more current and historical detail about Co Leitrim and the surrounding countryside. The historical settings in those histories would fit this history as well but it is too soon in the development of the Byrne history to be included. It was my earliest known ancestor, Thomas Byrne, <1817-->1869, and his wife Bridget McNiff that lived through the famine times in North Leitrim. Mary McGrail, nee Byrne's wedding certificate states that she was from Drumrewey. However, no Byrnes are listed in Drumrewy in Griffith's Valuation of 1857. It could be that Mary's first husband, Joseph Kellagher was from Drumrewey and Mary Byrne was from an entirely different townland, Mary moving there when they were married. In any event her wedding certificate in 1869 states that she was from Drumrewey. No McGrails are living in Drumrewy in the 1901 Census. Francis (unreadable) looks like Curins. A Bryne married into the McGrail family in 1869 and the issue of that union married into the McTernan family in 1895. Those connections are really what I hope to make of this history. Thomas Byrne was born before 1817, and died after 1869. The name of his wife was most likely, Bridget McNiff. They would have married sometime before 1837. Unknown Curran, nee Byrne, c. 1835--, born most likely in the townland of Drumrewey. Mary McGrail, nee Byrne, 1837--1913, born most likely in the townland of Drumrewey. Mary Beirne / Byrne / Bryne, 1837--1913, married Bartley McGrail Jr., 1834--<1885 in 1869. Mary was born in 1837, most likely, in the townland of Drumrewy, north of the town of Drumkeeran, in Inishmagrath parish, County Leitrim. Mary McGrail, nee Byrne, died at the age of 76 in the District of Carrick-On-The-Shannon, in the Fall of 1913. Thomas Byrne's son-in-law was Bartley McGrail Jr. At the time of his marriage in 1869 to Mary Beirne, Bartley McGrail Jr. was 35 years old and a widower, living in the townland of Lisfuiltaghan, a few miles from Drumkeeran, a larger town in Inishmagrath parish on a main road between Manorhamilton and Carrick-on-the-Shannon. The name of Bartley McGrail Jr.'s first wife is unknown. The Bryne townland of Drumrewey is sometimes spelled Drumrwey. Below is a photo of all that remains of the Byrne home taken in 2002. The Drumrwey records also state that the name of Mary McGrail, nee Byrne's mother was Anne Flynn. However, this Mary Byrne was baptized on July 26, 1835. One additional child was baptized on March 11, 1838 to Hugh Byrne and Anne Flynn. The name of that child was Pat Byrne (Bern). Bridget McNiff married Thomas Byrne sometime before 1837. Thomas Byrne and his wife Bridget McNiff had at least two daughters. The chart below gives a overview of both daughters and their spouses. The name of the first daughter is unknown. Thomas Byrne, <1817-->1869 and Bridget McNiff's had the following children. 1.1. Anne Curran, c.1870-->1897, immigrated to or born in St. Louis, MO. Anne was the baptismal sponsor for Elizabeth Silvy, nee McTiernan, 1897--1-20-1960. Anne Curran never married. 1.2. Theresa Curran, c.1870--, immigrated to or born in St. Louis, MO. Theresia married later in life. Her husband's name is unknown. None of the immediate family thought very much of her husband. Anne McTiernan, nee McGrail, 1870--1957, the daughter of Mary Byrne and Bartley McGrail Jr. referred to Anne and Theresa Curran as her 1st cousins. 2. Mary McGrail, nee Byrne, 1837--1913, was born most likely in the townland of Drumrewy, Inishmagrath parish. Drumrewey is sometimes spelled without the "e" as in Drumrwey. Mary was a widow at the time she married Bartley McGrail Jr. on July 29, 1869, at the Chapel of Inishmagrath or St. Bridged's in the town of Drumkeeran, Co. Leitrim. Anne Dunbar and John McGreal, the brother of Bartley McGreal Jr. were witnesses at the wedding. Mary Byrne's first husband was Joseph Kelagher. There is some reason to believe Kelagher's first name was Michael not Joseph. The 1857 Griffith's Valuation list the family of Myles Kellagher as living in Drumrewy. A Michael Kelagher from Drumrewey died on 3-23-1869, at the age of 50. A Thomas McMorrow registered the death. This Kelagher may have been Mary Byrne's first husband who would have died before she married Bartley McGrail Jr. in 1869. 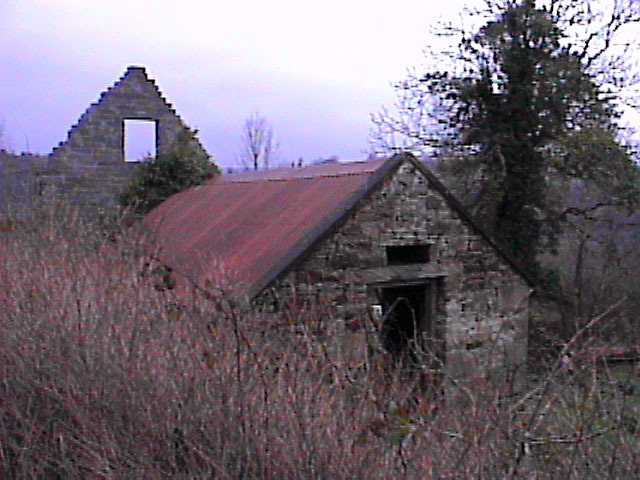 There are numerous Kellaghers in the townland of Lisfuiltaghan in the mid 1800s. On Wednesday, July 29, 1869, Mary Byrne married Bartley McGrail Jr. at the chapel of Inishmagrath or as it is known currently, St. Bridged's Catholic Church in Drumkeeran. Mary had a daughter from her first marriage to Joseph Kelagher by the name of Elizabeth who was 13 years old at the time of the wedding. Mary Byrne, 1837--1913, was 32 years old at the time of the wedding, in 1869. The fathers of both Bartley Jr. and Mary were listed as farmers. Bartley McGrail Jr.'s brother, John McGrail, was the best man and witness at the wedding. Bartley McGrail Jr. and Mary Byrne had to make their mark on the wedding certificate while John McGrail wrote his name. The other witness was Anne Dunbar. The priest that said the wedding mass was Father Patrick Cooke, C.C. The McGreal family name is spelled McGrail on the wedding certificate. Mary McGrail, nee Byrne's father, Thomas Byrne, <1817-->1869, was also listed on the wedding certificate, with the occupation of farmer. Thomas would have been born before 1817, and lived past 1869. The Drumrewy records state that there was a Mary McGreal, nee Byrne from Drumrewy that married a Peter Guihen, a widower, from Tullycorka on Jan. 22, 1885. Mary's father was Hugh Byrne. This might be the same Mary Byrne that married Bartley McGrail Jr. If this is true then it would mean that this marriage to Peter Guihen was Mary's third marriage and that most likely Bartley McGrail Jr. died sometime before 1885. This also would mean that Mary Byrne's father was named Hugh not Thomas. In any event, in 1869 Mary Byrne's, 1837--1913, marriage record states that her father was named Thomas and still alive when she married Bartley Jr.
After Bartley McGrail Jr. died, his wife Mary may have married Peter Guihen in 1885. Peter most likely died soon thereafter and Mary married Bartley McGrail Jr.'s brother, John McGrail. Bartley McGrail Jr., 1834--<1885, had died sometime before 1885. John McGrail, 1839--<1895, died sometime before 1895, the exact date is unknown. He most likely, died in the townland of Drumrewy, Tullycorka, or Lisfuiltaghan in the parish of Inishmagrath. John married Mary Byrne (Bryne), 1837--1913, sometime between 1885 and 1895. Earlier, Mary married John's brother, Bartley McGrail Jr. in 1869. In 1856, Bartley and Stephen McGrail, and nine others, are listed as farmers of 62 acres in Lisfuiltaghan, which is 360 acres big. The 62 acres are listed as owned by William Johnston. 2. Mary McGrail, nee Byrne, was born in 1837 and died in 1913. Mary was baptized on Tuesday, September 11, 1838, in Inishmagrath. The baptismal sponsors were Mary Byrne and Michael Martin. The connection between the sponsor, Mary Byrne and Mary McGrail, nee Byrne is unknown. As stated earlier Mary McGrail, nee Byrne, died in 1913. The McGrail land in Drumrewy was sold at that time. It appears that the McGrail's came from the townland of Lisfuiltaghan or from the bordering townland of Tullycorka and the Byrne's came from the townland of Drumrewy. Eventually, most of my direct McGrail line settled in Drumrewey. All three townlands are in the parish of Inishmagrath, Barony of Drumahaire in Co. Leitrim. Mary Byrne had a daughter by her first marriage to Joseph (Michael) Kelagher. Her name was Elizabeth. The union of Bartley McGrail Jr. and Mary Byrne produced at least three children. Anne, Stephen and Honnor. Honnor was known as Hanna. Stephen McGrail may be named after Bartley Jr.'s uncle or brother. Bar. of Drumahaire Bartley McGrail Jr.
John McGrail, 1839--<1895, was Mary McGrail, nee Beirne's third husband. The townland of Drumrewy is NE of the town of Drumkeeran in Co. Leitrim. In America, the 1890's were called the "Gay Nineties". Apparently life in Ireland during the 1890's must have been much harder. Bartley McGrail Jr., 1834--<1885, and Mary Byrne's three daughters immigrated to America during the 1890's. Their son, Stephen McGrail, stayed behind in Ireland. The descendants of my Byrne family have been in America since c.1892. On the my maternal side I descend from Tara who was one of the 7 European daughters of Eve. Even though I am a male McTiernan, my mother was a Fries and her mother was a Blaies and her mother was a Bender so I have their mtDNA but my children would not. They would have their mother's mtDNA not mine. The mtDNA is passed down maternally not paternally. The maternal mtDNA tracking is explained at http://mctiernan.com/mtdna.htm. The McTiernan or McGrail histories have a full list of all the descendants of Mary McGrail, nee Beirne, 1837--1913 who was my Great Grandmother. Anne McGrail, 1870--1957, who was both Mary McGrail, nee Beirne's daughter and my Grandmother married Hugh McTiernan VI in 1895 at the Chapel of Killargue. A Clan web page for the McGreal / McGrail families. The Beirne / Bryne / Byrne web page for all who are looking for connections is at http://mctiernan.com/beirix.htm. The Beirne / Bryne / Byrne PAF listing of all known Byrne descendants is at this web site: http://mctiernan.com/beipaf.htm. McTernan / McTiernan, Carney and Byrne graves in the old grave yards in Killargue and Drumahaire. While the Armorial Arms used in this paper are valid as belonging to the Beirne family, as yet there is no direct connection to my Byrne family line. A Bridget McNiff married Owen McGrail in Drumkeeran. This is the McGrail family of Hugh McGrail of Boston, MA.